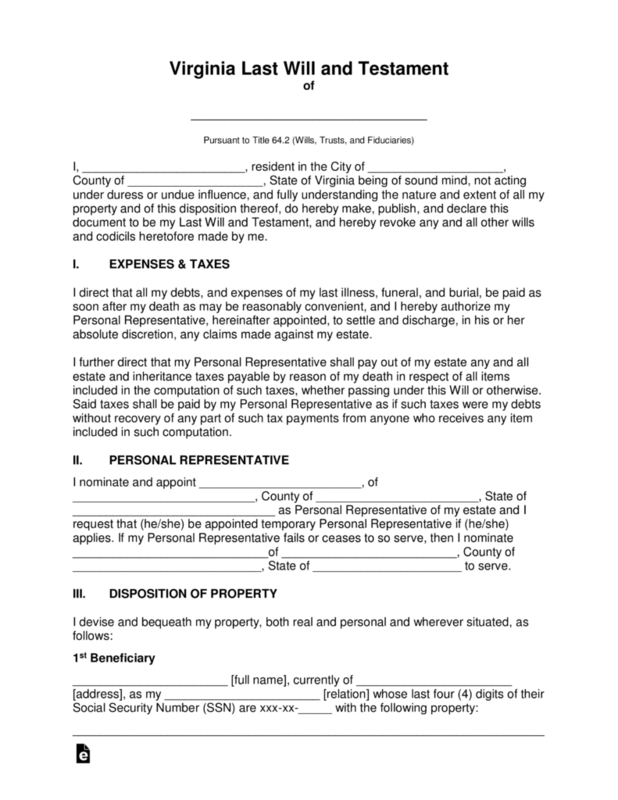 The Virginia Last Will and Testament is considered a legal document in the state, whereas a testator is allowed to construct a document that will designate for distribution by the testator’s chosen executor, the assets of their estate upon their death. These assets may include but not be limited to real estate property, vehicles, personal property, fiduciary assets, businesses among others. These assets, besides being meant to continue the financial security of their spouses and/or children, could be designated for other beneficiaries such as friends, extended family members or even various institutions or charitable organizations. As the testator has completed and is satisfied with the distributions, the document is required to be signed by two witnesses and will also be witnessed by a notary public. The testator’s document may be revised or revoked at any time. Signing (§ 64.2-403) – (A) The Will is valid if handwritten and signed by the testator and it must be proved by two disinterested witnesses. (B) If not handwritten by the Testator, the Will must be signed by the Testator and Two (2) witnesses in the presence of each other, including the Testator. 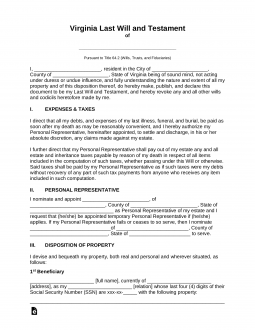 Step 7 – Notarization – Once the document is complete, all signatures must be witnessed and authenticated by a notary public of the state of Virginia.